Welcome to Jean's Clay Studio online. Contemporary Stoneware Pottery handmade in Milwaukee, Wisconsin. 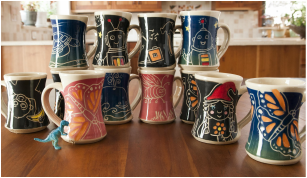 Distinctive, fun and functional pottery for everyday use. 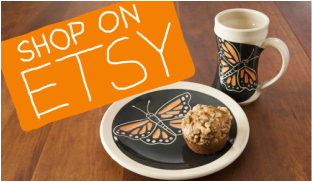 Plates, bowls, mugs, vases and more. Wedding gifts, pottery for kids, and even pottery gifts for men! I create each piece by hand, one at a time. My stylized Designs are hand drawn and individually carved onto each piece by a process called "slip-carving or "sgraffito." All of my pottery is lead-free, dishwasher, and microwave safe.